WE HAVE A PLAN TO GET YOU THERE! La Joie of Celebrations is a wedding & event planning company focused on designing and producing joyful events. 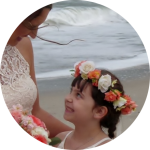 The Coral Rose Flower crown created by Phyllis was perfect for my flower girl at my wedding. So pretty! Mrs. Davis is a doll! She did such an awesome job on my outdoor spring wedding last year. Her creativity is limitless. She used my budget efficiently so that I got the best decorations and designs possible. Everyone loved the beautiful arrangements and cascading design of fabric that she used to drape on the outdoor columns. I wanted to add personal touches throughout the wedding and she intricately incorporated them. She was so easy to work with and truly a joy! Also I had a situation where I needed a boutonnière for my husband and she handmade a beautiful one on the spot! She is very good at what she does and I would recommend her to anyone! Thanks Mrs. Davis!! Mrs. Phyllis is one of the most kind-hearted people I know. She did an outstanding job on my youngest brother’s graduation dinner this May. She turned a plain room into a work of art. Mrs. Phyllis made that night one to remember for years to come. She is so creative & a joy to be around. I highly recommend La Joie of Celebrations for all of your dinners, parties, weddings, etc. You won’t regret it! The ladies of our “Hatitude Tea” fundraiser committee thank you and really appreciate your gracious effort. The decorations were done with class, style and elegance. The beautiful arrangements of flowers, table settings, and an array of hats especially impressed us and our guests. We thank you for your love for God, people, and your decorating gift. Anyone would be most pleased with the level service provided by La Joie of Celebrations. May God continue to always bless you! Two weddings…two beautiful events. My niece and nephew both used La Joie for their weddings. The floral arrangements from the centerpieces to the brides’ bouquets were uniquely beautiful. I could tell Phyllis had taken their dreams and turned them into reality. Beautiful….simply perfect!